Our team has been busy sharing fun ideas for our super fun treat bags - and we aren't finished yet! 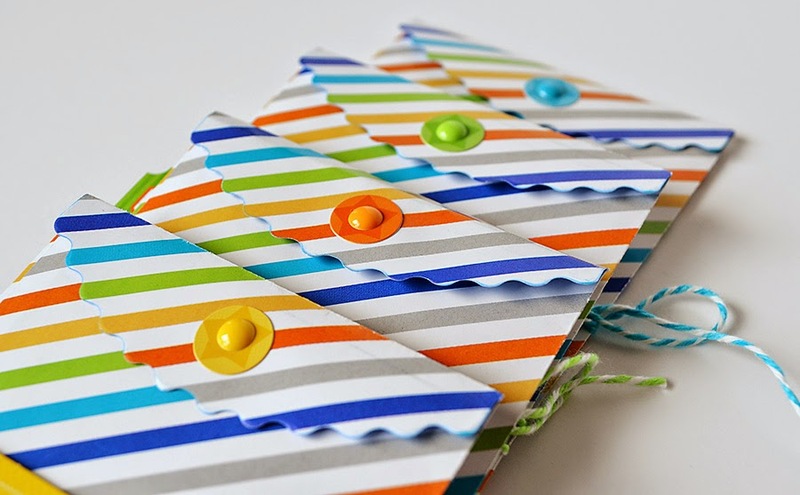 Wendy Sue is here today sharing a fun idea for turning these cute bags into envelopes for mini cards! I just love the little treat bags that coordinate with the "hip hip hooray" collection. They are about 3 1/2" x 5" in size -just the perfect size for holding a mini card - ideal for tucking into a gift bag or attaching to a package! Here's a look at each card and envelope set, with some instructions for creating the envelopes. First, I embellished each treat bag by wrapping doodle twine around the bottom portion of each bag. Next, I added a ticket embellishment from the "hip hip hooray tickets" set. I used foam adhesive dots under each ticket for a bit of dimension. After folding over the top flap of the bag, I placed a small sticker from the "this & that" cardstock sticker sheet in the center of the top flap. Finally, I added a coordinating "sprinkle" to the center of each sticker. After the envelopes were completed, I used coordinating items to create mini cards to tuck into each envelope! Such a fun idea. ! SUPER CUTE cards and FABULOUS envelopes - what a great way to use the treat bags!!! Wow, can I just say these are awesome sauce!!! Love the ideas that Wendy Sue showed us - she is amazing!! I am going to pin these ideas and make something cute very soon!!! Totally awesome idea! I purchase these bags. They're so great! The paper is nice in strong and the color is bright and shiny! Love them!